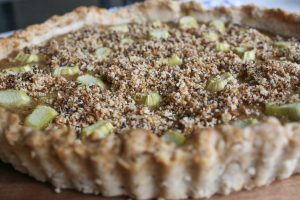 Anyway, I do swap the cake and opt for a piece of fruity tart instead, not an apple tart though 😊 but a tangy and creamy ‘Tarte à la Rhubarbe’ (Rhubarb Tart), topped with a crunchy almond crumble and paired with a delicious coconut whipped cream. Going an inch lighter does not have to be boring, does it? This recipe is perfect when you don’t have much time to spend in the kitchen. If you are not a fan of rhubarb you can change for any other fruits such as strawberries or raspberries. I hope you try and like this recipe, if so let me know! Share on Pinterest and tag a photo on Instagram #mimies_delicacies so that I can see your lovely creations as well as helping me reach more of you lovely people! Merci my friends! Deliciouly crunchy, creamy and slightly tangy! Place the diced rhubarb, water, cinnamon and maple syrup into a saucepan. Leave on a medium heat for about 15 minutes, stirring occasionally. Take it off the heat and mix onto a blender so that there are no chunks of rhubarb remaining. Next, add the coconut cream and the ground chia seeds (used to set the mixture). 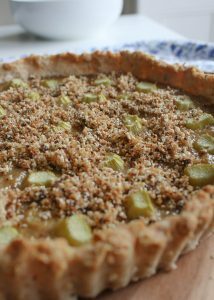 Fill your pre-cooked tart with the rhubarb custard and decorate with the remaining diced rhubarb on top. Put it back in the oven for 20 minutes. Mix all the ingredients in a food processor and place under the grill of your oven for 5 minutes or until the crumble turns a nice golden brown. 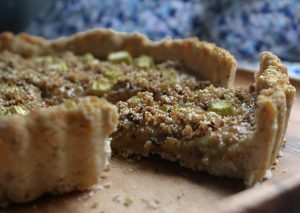 Once the tart is baked and has cooled down, sprinkle on top, serve … enjoy! 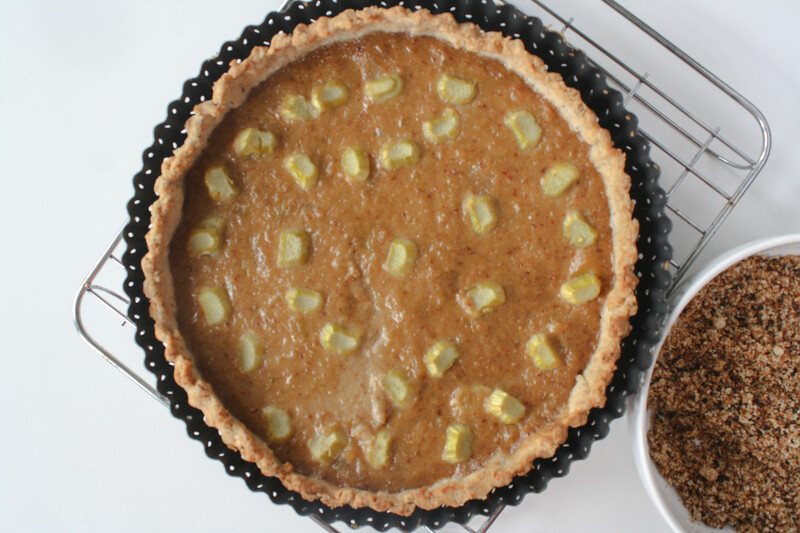 * you can swap the coconut cream for soya cream instead, although coconut cream and rhubarb are a great match!